The plot is about a poor but intelligent and hard working person Vasu and his journey of life. Fate is not always with Vasu and he faces many problems in each phase of his life. He gets inspired by Karna, a mythological character in the Hindu epic Mahabharatha and relates himself to Karna as they both struggled to withstand against fate. Be it an illusion or through meditation, whatever may be the reason, Karna appears before him to listen to his problems and guides him in a right direction. 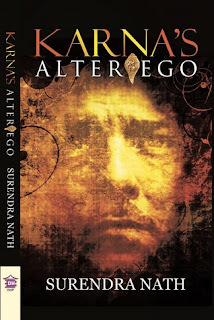 I too loved this plot by reading the blurb and wanted to see how the author can give advice for current generation through the mythological character Karna. The narration is very simple to follow and I enjoyed the book till half. But, after that, it seemed like dragging by providing more lectures on morals through Karna. It became boring, repetitive and very preachy. The climax is good, though. I loved the bonus information provided at the end of the book about Karna's life incidents. It is refreshing to read Mahabharatha in the perspective of Karna. The questions raised by Vasu to Karna and Karna's replies are justifiable. This book teaches positive spirit. Always raise up high when stuck with problems and never lose hope. The best always waits for you which you deserve the most. Surendra tries his hand at writing fiction off and on. A few of his short stories have been published in books and magazines. 'Karna’s Alter Ego' is his first attempt at writing a full length novel. Earlier he wrote a novella that sank without a trace. For a living, at 58, he runs after children in KiiT International School, and the strength needed for all this chasing, he draws from his previous experience in the defence forces. He also publishes a children’s magazine – 'Kloud 9'. He is the architect of a Children’s Lit Fest, that is into its third year now in 2015. Yes, he is married and lives happily with his wife and daughter at Cuttack. He has distant dreams of retiring as an author. Ps: I have received this free e-book from the author in exchange of an honest review and this is my unbiased opinion. Thanks for this wonderful review, Ramya !! !